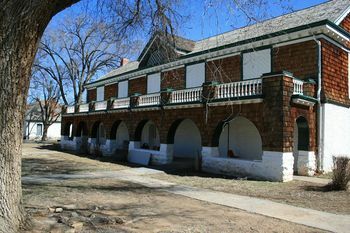 Fort Stanton (1) (1855-1896) - First established 4 May 1855 as a temporary camp while the permanent fort was constructed by Lt. Colonel Dixon S. Miles (Cullum 387), 8th U.S. Infantry. Originally named Camp Garland after Colonel John Garland, 8th U.S. Infantry. The permanent post was named Fort Stanton after Captain Henry W. Stanton (Cullum 1155), 1st U.S. Dragoons, killed by hostile Apache Indians, 19 Jan 1855, near the fort location. Abandoned in 1896. Fort Stanton Restored Admin Building. Fort Stanton Junior Officer's Quarters. Initially established in 1855 to protect settlers and to enforce treaties with Indian tribes. Initial construction lasted several years and the Fort was damaged by changes in ownership during the U.S. Civil War. A major rebuild and updating began in 1868 and the post became a substantial facility with over 40 military structures before it closed. Union troops occupied the Fort at the beginning of the U.S. Civil War but abandoned it on 2 Aug 1861 as Confederate troops approached. The Confederate force only occupied the post until 10 Sep 1861 and they withdrew. Union forces, consisting of five companies of New Mexico Volunteers under Col. Kit Carson, reoccupied Fort Stanton in 1862. In 1868 the Fort was ordered rebuilt and construction continued for a number of years. On 29 May 1873, Congress created the Mescalero Indian Reservation adjacent to Fort Stanton and the troops were regularly called upon to police both Indian depredations and settler vigilantes. The hostile Indian problems and reservation policing kept the garrison occupied until the 1880s but by the 1890s those problems were largely over. The Fort was ordered closed 28 Oct 1895 and on 17 Aug 1896, the last troops departed. The post lay abandoned until 1899 when the Fort property became a part of the Marine Health Service as a TB treatment facility. This organization became the National Health Service in 1912 and the hospital continued in operation until 1953. In 1935 the Civilian Conservation Corps (CCC) set up a camp adjacent to the hospital and that camp functioned until the beginning of World War II. Starting in January 1941, the abandoned CCC camp at Fort Stanton formed the basis of a German Alien Detention Center (ADC). The first occupants were internees from the scuttled German Luxury Liner SS Columbus who were classified as "distressed seaman paroled from the German Embassy" because the U.S. was not yet at war with Germany. The 400 German sailors were transferred from an Angel Island, California, detention camp to Fort Stanton starting on 27 Jan 1941, with the last 331 arriving on 17 Mar 1941. Initially, the German government funded the camp and the sailors lived well but after the U.S. impounded German Funds and then declared war against Germany the U.S. government funded the camp operation. After the U.S. entered the war the Department of Justice (DoJ) brought in border patrol agents as guards and the barracks were surrounded with a barbed-wire fence. Rations and conditions then became more like prison-like. The prisoners also changed becoming more ardent in their Nazi beliefs and less tolerant of those who did not share them. The government responded by relocating the prisoners who were at risk leaving the diehards at Fort Stanton. The DoJ also established a small disciplinary camp at Fort Stanton for Japanese "incorrigible agitators" which they named "Japanese Segregation Camp #1." By late October 1945, there were 58 Japanese Americans incarcerated at Fort Stanton. 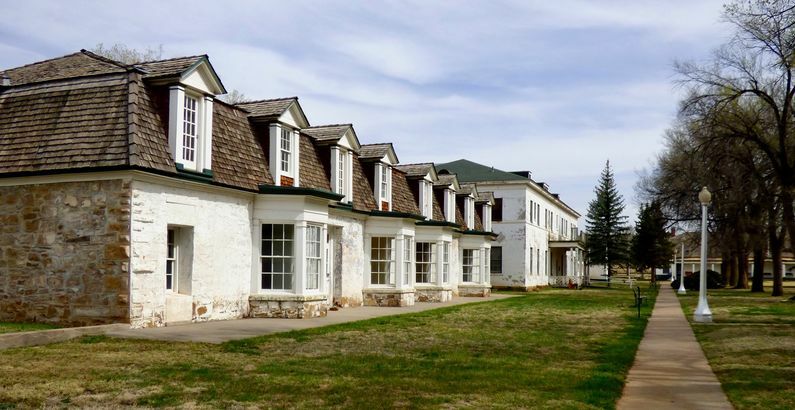 The Fort Stanton Alien Detention Center closed on 1 Oct 1945. The hospital became a state hospital until 1995, and then a state detention center for women until 1999 when it became a rehab center for at-risk youth. A New Mexico State Monument since 11 Aug 2007. Several original stone buildings still remain, but none are open to the public. 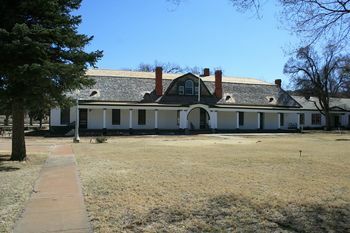 A museum and visitor center is located on the grounds and is about to move into the restored Admin building. Location: Fort Stanton State Monument, Lincoln County, New Mexico. Jaehn, Thomas, German Sailors on the High Desert: A WWII Detainment Camp at Fort Stanton, El Palacio, Vol. 116, no. 1 (Spring 2011), Pdf, page 36-43. This page has been accessed 8,792 times. This page was last modified 15:25, 17 February 2019 by John Stanton. Based on work by Bill Thayer.